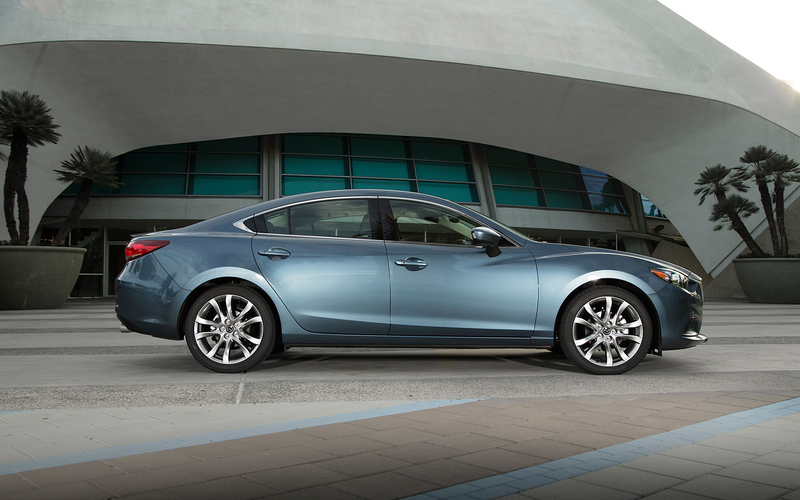 Have you seen the all-new 2014 Mazda 6? If you haven’t you really should. The new 6’s “Kodo” design language instantly vaults it from a forgotten mid-size family sedan to a flashy alternative to the likes of the ho-hum Big Three from Japan – the Toyota Camry, Honda Accord and Nissan Altima. The 2014 Mazda 6 in Soul Red (its signature color, according to Mazda). Previously joined at the hip with Ford (Ford owned 1/3 of Mazda), the last-generation Mazda 6 was based on the Ford Fusion. Both were rather unremarkable and, by all accounts, the lucrative mid-size market had passed over Mazda. In 2012, for every Mazda 6 sold, Toyota sold 12 Camrys and Honda sold 10 Accords. Introduced for the 2013 model year, the Fusion represented a quantum leap forward in styling for mid-size, mid-price family sedans. This is a 2014 Fusion. 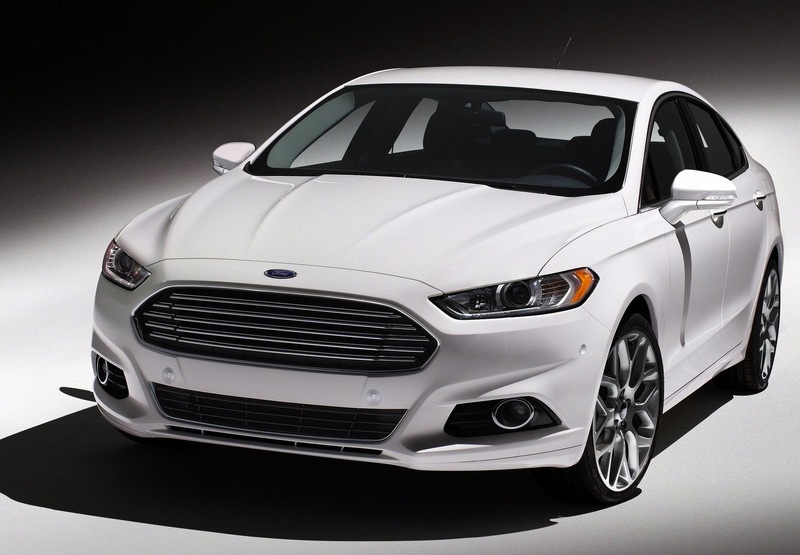 Last year, Ford shook up the mid-size family sedan segment with its sensational 2013 Fusion. Sporting an Aston-Martin inspired nose and swoopy 4-door “coupe” styling, the Fusion instantly vaulted Ford into mainstream consciousness. Great styling can sell a car without spending a dollar on marketing. While the rear of the 6 looks similar to other Japanese sedans, it manages to be distinctive with all those creases and curves. 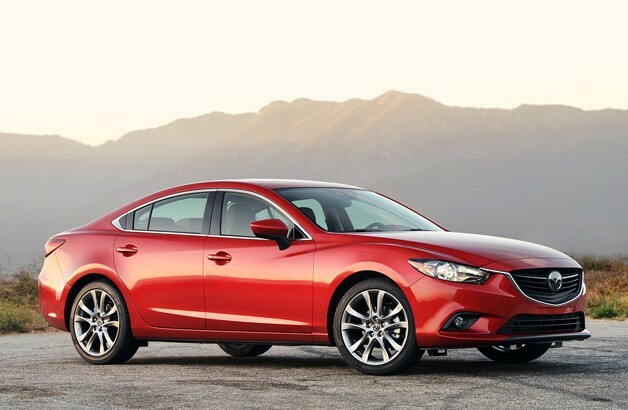 Together with the new Fusion, the 2014 Mazda 6 represents a new paradigm in what was once the blandest segment of the automotive industry: The mid-size family sedan. The corporate fleet car. The airport rental. Left to its own devices, without the development dollars or meddling influences of outside managers, Mazda’s engineers cooked up the company’s SkyActiv smorgasbord of technologies to create a complete automotive banquet. The umbrella term “SKYACTIV” (I hate the all-caps) includes the use of ultra-high tensile steel, lighter and stronger wheels, direct gas injection, high compression, lower-friction materials, i-Eloop (yeah, another loopy name) regenerative braking and the new SkyActiv-Drive 6-speed automatic transmission with faster shifts, lower friction and smarter software. All you really need to know is that it works in perfect harmony. The new 2.5L 4-cylinder Sky-G direct-injected gas engine makes 184 hp and 185 lb-ft of torque. (It’s also the only engine currently available.) 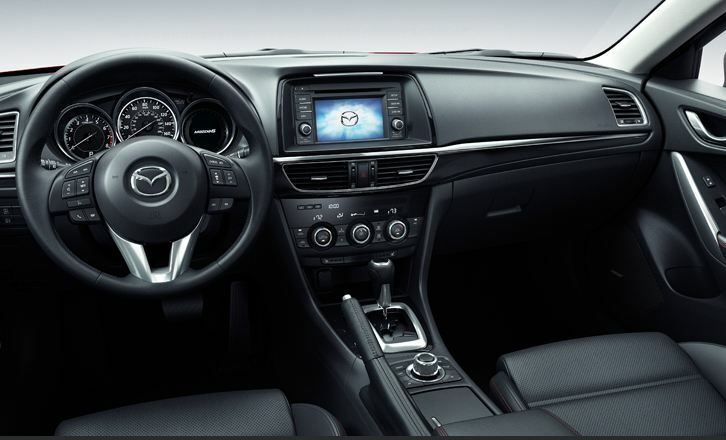 Coupled with the 6-speed SkyDrive automatic, the Mazda 6 is rated at 38 mpg on the highway (26/30/38). If you opt for the Grand Touring model with the Technology Package (that includes i-Eloop regenerative braking), all the fuel economy numbers are pushed up by 2 mpg, which allows the Mazda 6 coveted 40 mpg bragging rights. The styling is muscular and sleek, like a cheetah waiting to pounce. The designers used some slick tricks to make the hood look longer – like a rear-drive car. The roof slopes in like those far more expensive 4-door coupe models such as the Volkswagen CC or the Mercedes-Benz CLS. The taut metal is creased and molded with evocative purpose under Mazda’s Kodo design theme – which Mazda says loosely translates to “Soul of Motion” to showcase the “graceful movement of nature.” Yeah, I can see eyes rolling now. If you skip all the designer hyper-babble and just step back and enjoy the view, you know it all works beautifully. This great design starts at $21,000 – proving that mass market, mass segment transportation doesn’t have to a boring appliance. 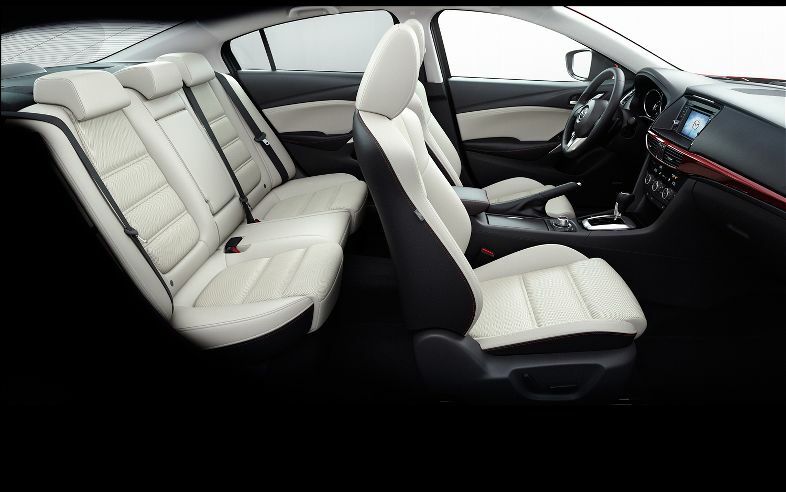 Mazda only has two choices for the interior: Somber Black or Bright Almond (which looks white) . Something in between like grey or tan/saddle would be nice. 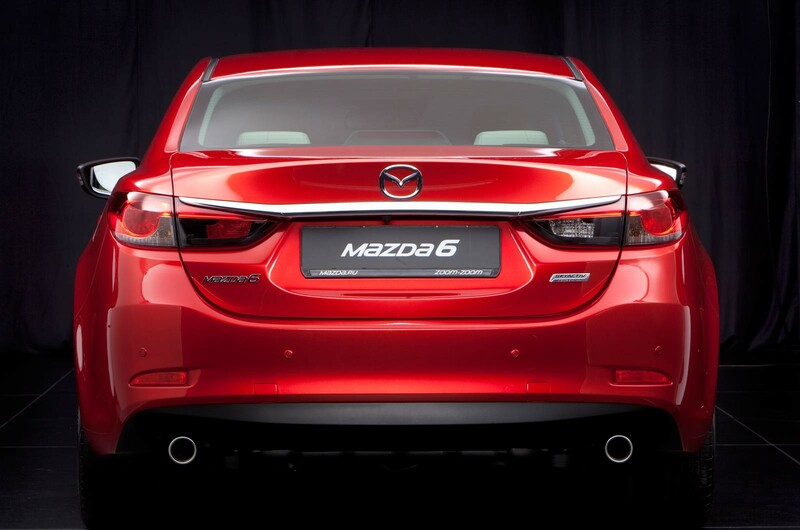 The Mazda 6 feels and drives lighter than other mid-size sedans. The new electric power steering was light, but communicative and you could easily toss it into curves and turns. The leather-wrapped steering wheel felt great in my hands. The chassis seemed tight but flexible. It was able to soak up road imperfections with ease and without fluster. I didn’t feel punished like I do when driving a BMW with its rock-hard run-flat tires. I don’t love everything about the new 6. I found the engine a bit lacking in low-end torque and it had to be pushed hard to move quickly. A turbo would perk up this excellent engine and I’m sure Mazda engineers are working on one (even if they say they aren’t). Inside, some of the plastics felt cheap, particularly in the base model. The 5.8” full-color touch-screen infotainment and navigation screen worked well, but felt small compared to the 8” MyFord Touch unit in the Ford Fusion or the 8.4” U-Connect screen in my Dodge Charger. This is the “Almond” interior. It looks off-white in person and while I like it, I think it would show dirt quickly. There were lots of dead buttons and I hate that. Of course the answer to this problem is to pop for the top-of-the-line Grand Touring (GT) model with all the option boxes ticked. Then there are no dead buttons to remind you that something was missing. I think that the $30,490 GT with the $2,080 Technology package is a real bargain, considering the raft of cool tech all bundled together. In fact, for many years now, Mazda has led the way in loading expensive luxury technology into affordable mainstream products like its volume-leader Mazda 3. There are only a couple of things I’d like to see on this list. Cooled front seats would be nice, particular in warmer climates like we have in Los Angeles. All four windows should be one-touch up/down – it costs nearly pennies. A thinner smart key would be better for pants pockets. Do I want it? No, but that’s just me. I’m waiting for a different power plant. Before the end of 2013, Mazda will introduce its first diesel engine in the U.S. market. 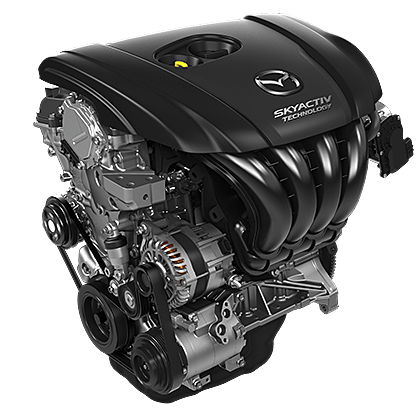 The all-new SkyActiv-D is reported to be a gem, boasting the world’s lowest-compression ratio. The low compression ratio cuts emissions enough to eliminate the need for expensive exhaust treatments and it meets both European and U.S. standards. The 2.2 liter engine gets a two-stage turbocharging system with a small turbine that boosts low-end torque while a larger turbo increases high-end horsepower. It should produce around 173 hp and a whopping 310 lb-ft of torque. The diesel should deliver stellar mpg. Car and Driver reported an estimated highway 43 mpg while Popular Science predicted 56 highway mpg. With the 6’s 16.4 gallon tank, it could have a hybrid-busting 700+ mile cruising range. That’s what I want!